Into The Breach is ranked in the 98th percentile of games scored on OpenCritic. Into The Breach has given me faith again in the polish and the promise of the indie game developer, and reminds me that amazing things can be achieved on the smallest of canvasses. Subset also deserves credit for the game’s deliberately limited, laser-focused scope. Every aspect of Into The Breach’s design—the gorgeous soundtrack, the bleak storytelling, even the way characters quip about the in-game reset button—contributes to making the player’s battles feel like a life-or-death, “We’re canceling the apocalypse” moment. A Worthy “sequel” to FTL, and a really interesting and fun strategic game. It feels like Advance Wars in many ways and is remarkably playable and enjoyable. Much more than a turn-based strategy game, than a sci-fi game or than just any other indie game, Into the Breach is a masterpiece. Challenging without being unfair, complex without being overwhelming and familiar without being cliché, it's perfectly balanced to provide a unique experience. Subset games has achieved a mastery of the microdrama, and as such, Into The Breach is about as essential as indie games get. Into the Breach is enthralling from the moment you start playing, and doesn’t let go. Every calculated move by the enemy can be countered. Every mistake is your own. And as death will come swift and often, in time, so too will victory. And being victorious has a greater sense of accomplishment because it feels earned with each battle being hard fought. Subset Games have crafted a game that absolutely excellent from the gameplay to the music. Into the Breach is near perfection. With Into the Breach Subset Games rewrites the tactical gameplay rulebook by removing most of its pages. In doing so, it has created a superlative strategy game. Subset Games has delivered one of the tightest strategy games we've ever seen. After the seminal FTL: Faster Than Light, Subset Games eludes the so-called "sophomore slump" by contributing yet another extraordinary touchstone in the gaming industry, Into the Breach. If you commit and dig in, you'll be rewarded with that rare feeling of accomplishment in a videogame. Not because you leveled up or because you managed to get one over on the game, but because the puzzle feeling of Into The Breach makes the game appear to be extremely fair. I never feel like I've been tricked when I lose, and I never feel like I've done something out of bounds when I win. Into the Breach is a simple yet engaging strategy title that pushes you to carefully consider every move, and makes victory seem that much more rewarding as a result. It’s quite an addictive title, and expect to spend quite a bit of time mastering it and feeling like you might be able to eke out a victory in the great war between man and insect. A refined, masterfully executed and hugely atmospheric turn based tactics game. The framework of Into The Breach is a little light on content, but the variety of missions approaches and challenging scenarios that emerge from its elegant systems provide hours of compulsive, bug crushing strategy goodness. Not like other SLG, pushing is much more important than damage in Into the Breach. Your strategies must change a lot to fit the new rules, which makes the game interesting and unique. Besides, you can find roguelike elements, a great variety of mechs, and challenging enemies in it too. It is definitely one of the biggest surprise you can get these days. It's quite easy to spent a sleepless night with Into the Breach's addictive tactical gameplay and tons of options to customize our party. This game do not forgive mistakes, but gives you an opportunity to think and find solutions to many interesting tactical puzzles. Into the breach is a shiny little gem of an indie game, with an almost perfect gameplay, a huge level of customisation and an endless replayability. In just a few days it has become one of the most addictive gaming drugs ever. This turn-based game is worth every penny: the developers have created a superb and minimalistic strategy game, which has an excellent system of achievements making you crave for more and more and more... Remember – defeat is only a beginning and the satisfaction is great! A stripped-down strategy game which will hook you in from the get-go, Into The Breach is another triumph from a tiny studio. A fun but challenging strategy game that blends a fun time-travel aesthetic with great turn-based mechanics. Interesting time pressure gameplay makes every battle rewarding. Heartily recommended. Into the Breach is one of those gems that will be talked about for the rest of 2018; a game that will come up in game of the year discussions and beyond, because it's just that good. Into the Breach is brilliant in how it approaches the strategy game genre. By giving the player all the information they need, it's easy to see where exactly you went wrong, and what you could've done to prevent it. This 8-bit gaming triumph proves you don't need overly complicated mechanics or 3D graphics to provide a stellar strategy experience. Into The Breach arrives to the Nintendo Switch in a surprise release, and it's a must-play for fans of tactical games with the mettle to persevere. Into the Breach evokes a feeling that only the best strategy games can accomplish: it makes me feel smart. Complex under its minimalistic shell, Into The Breach is an excellent turn-based tactics game. Into the Breach borrows confidently from FTL's successes, but differentiates itself as a tight, highly replayable tactics game built around avoiding non-combatant casualties and collateral damage. Strong art and music combine with excellent mechanics and an emphasis on strategy and players choice to create one of the best strategy games in years. I am a huge fan of FTL, its premise, game play, style and utter nonsense randomized paths and subset games have only gone a dropped another gaming bomb on me. Into The Breach has been an incredible game to play. Undoubtedly, one of the best features of the game is unlocking new mechs and creating your own squads, and it is that element that will keep me coming back to the game. Hop into a breach and pick up this game yesterday, soldier. It's Vek-hunting season. Into The Breach is a brutal, uncompromising game of making hard decisions and living with your mistakes, but the short length of battles and endless variety of playthroughs makes for an extremely addictive experience. Though the graphics are nothing special, the gameplay is some of the very best you'll find in the strategy genre on the Switch, and we can easily recommend this to anybody who's looking for an in-depth game that'll make you think. Into The Breach feels right at home on the Switch, and whether you play more at home or on the go, you're more than likely to get plenty of value out of this release. Motivating turn based strategy roguelike with tactical depth, which remains exciting in every single lap despite simple graphics. If you’re not a major tactical strategy fan you’ll probably feel a bit overwhelmed by the challenge Into the Breach poses, but if this is your wheelhouse it should absolutely satisfy. While less elaborate than the likes of Kingdom Battle the pacing and style are also probably better suited to play on the go or enjoyment in quick bursts since most maps are about surviving a set number of turns rather than having to eliminate all threats. While it isn’t likely appropriate for a mainstream audience with its steep learning curve fans of strategy games will likely enjoy this addition to the Switch library. The pixel art style and isometric strategy battles remind me of all the good parts of games like Final Fantasy Tactics. Subset Games have a lot of experience in developing rich roguelikes, with previous title FTL standing out, and they’ve used that experience to blend with this strategy game to make a title that is definitely worth a look. Into the Breach presses all the right buttons to keep tactical strategy fans hooked, and many will come back over and over again despite any shortcomings they may perceive. I, for one, plan to waste away many more afternoons saving the world from an infestation of bugs. Then, once I finish spraying my house and yard, I plan to play some more Into the Breach. Into the Breach is an excellent tactical game. It feels like a game of chess with robots and aliens, and it offers a very deep gameplay behind its simplistic looks. Tight, lean, and expertly crafted, rarely is so much accomplished with so little. Subset has taken positional play in turn-based tactics to its extreme. The result is at once unique, accessible, and mindbending. Every round is a newly created puzzle with perfectly pitched difficulty, and that is seriously impressive design. Little big turn-based strategy with simple graphics does not disappoint you. It is unique, just a bit eventless after several attempts. I gave Into the Breach about ten hours of my time, and while I don't feel like that time was wasted, I also have no desire to go back and play it again. After one or two playthroughs, you'll have seen just about everything the game has to offer. For those who are into turn games and mechs, this game will definitely pique your interest and satisfy your fancy. 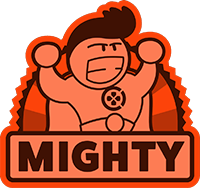 And especially for those who are into challenges, this game will definitely challenge your brain to outwit your opponent before you fail one of those bonus missions. 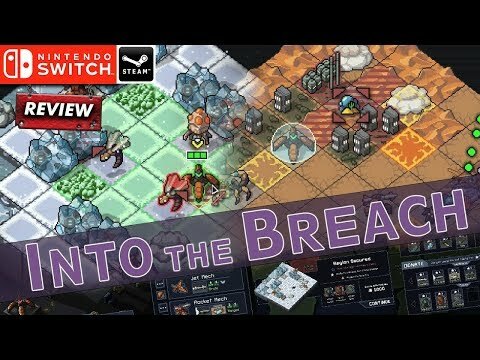 Though, if you're looking for something a little more story-based, you may want to look somewhere else as there is no linear path of story for Into the Breach.